I mentioned the fetching that I was knitting for my niece. It was such a quick knit that I ended up making another pair for my other niece. It makes sense, they are cousins after all. I still want a pair for myself but too much of a good thing isn't always good for you. I think for sake of originality I may detour my fingerless knitting over to the maine morning mitts. Have I said how much I love free downloads? I really do. 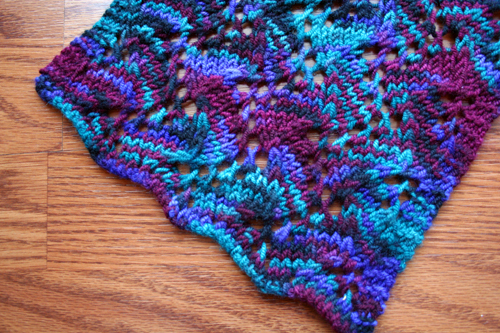 Speaking of free downloads, when I purchased some Hacho yarn (Mirasol project) at my LYS I was given a free pattern called the Superior Travelling Vine lace scarf. At the time I wasn't sure if I was going to use it but in the end I am so glad I did. I love this scarf. 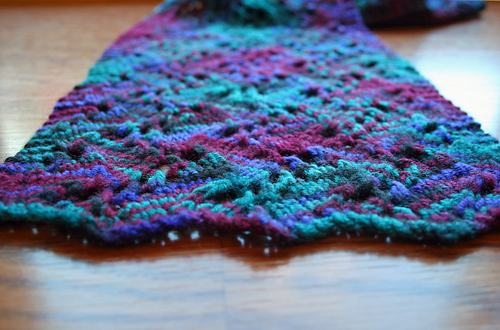 For a lace pattern it wasn't difficult to work up and the hacho yarn displayed beautifully. As tempting as it was to keep the scarf for myself, the gifting season was around the corner and giving (handmade items) makes my heart a flutter so off it went in the MIL pile. She loves it btw. Fast forward to a recent crazed search for the pattern, in my ever increasing pattern pile, it was becoming oh so apparent the pattern could not be found. Sadness ensued. Being the persevering type I pressed on and began a search at ravelry. Found. Joy followed. 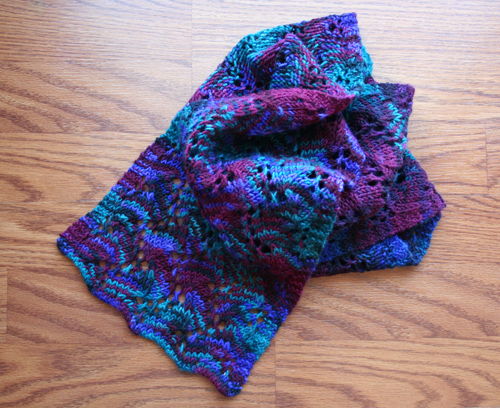 But unless you have a ravelry account that little bit of information won't help you much so after searching one of my favorite yarn websites I found a link for a whole slew of free patterns, PLUS a download for the scarf I speak of. More joy. So beautiful. I bought some yarn and needles. I'm going to try the link off of the Soulemama blog for toast/toasties. Wish me luck. like this one if you are looking for something to knit for random friends. Monica - Oooo, go for it. Once you get the hang of it you'll be a knitting wench ;) It's practicality on the go I say. What's a toastie? What a beautiful scarf! I love the colors. I'm so glad to have found your blog.